Shilpa Bansal analyzed this further: “Interestingly, I have come across such students who are very intelligent and hyperactive. They have very limited attention span and hence a lot of fidgeting and difficulty to sit and listen. These kids cannot bear pauses or slow lectures. Their brain simply makes them do multi-tasking, which sometimes could be a disturbance to the class.” Her observation that “Usually, teachers try to instill discipline (which is an order) or chide the student,” was followed with the consequence: “Slowly, they are made to learn the herd mentality, where they are taught to behave in social circles and they cease to show the same curiosity.” Acknowledging that “it becomes very challenging for a teacher to ensure that each student does not lose any of his individualistic qualities,” Shilpa’s clear enunciation of the dangerous consequence of ‘shutting up’ such a child cannot go unheard. The child may fall in the Asperger’s syndrome range [according to Indrani, this child is averse to team work]; or may be having mild or severe ADD (Attention Deficit Disorder) – a behavioural condition which also affects learning. Observe if the child is mainly a kinesthetic learner. In that case, he will find it difficult to be inside classrooms all the time. “I was teaching a class of 20 plus-aged youngsters, in a college in North India. Being a fresh student from the University myself, it was my very first experience of teaching. And who were my students? Young adults, taller and stouter, and only a couple of years younger than I. I was told that this was ‘the most notorious class’, disrespectful to the teachers and disinterested in learning. 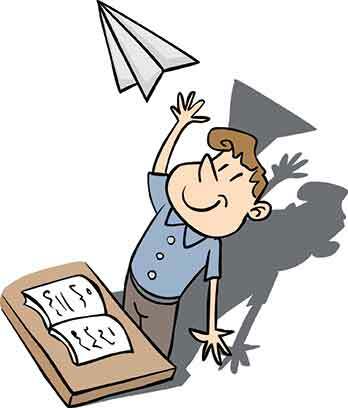 “On the very second day with these young adults, some of them unabashedly started making paper airplanes and flying them in the classroom. They did so right in front of my eyes, not even waiting for my back to turn as I wrote on the board. It took me a fraction of a second to respond – and before I knew, I had picked up some of these planes and was flying the planes along with them. “There was an awkward moment in the class. They could not understand my response. Some of them hung their heads with shame – although that was not my intention at all. Children (human beings as such) are worthy, respectable, and capable individuals irrespective of what they say or do. Their actions/words are not a reflection on you as a teacher – so don’t take it personally. Do not judge them for their actions/words. Trust them for their genuineness and their intentions towards learning. The children need to be acknowledged and respected for who they are. One can understandably ask: Why then did these students chuck paper planes at the blackboard, in full vision of the teacher? With this, we conclude the discussion around Indrani Barua’s question. Note: Teacher Plus would like to inform readers that this is the last article in this column. In the Staff room is being discontinued for want of responses from teachers to the questions asked here. The column was started with the intention of bringing teachers together to ask and answer each other’s questions and come up with solutions. We thank the few teachers who have enthusiastically participated in the discussions featured in this column. We have to interact with such a delightful child (aged 5+) and though we all like him a lot we just can’t find a way to stop him having a viral effect on the other very young members of our children’s library. We must restrain him a little in order to do meaningful activities, but at the same time we do not want him to lose any of his excellent individualistic qualities. The author is the Founder-Director of Thinking Teacher, an organization that is working towards creating a network of reflective teachers who seek each other’s views on a range of issues pertaining to teaching and learning. She can be reached at thinkingteacher22@gmail.com.